The Global Volcanism Program has no activity reports for Bunyaruguru. The Global Volcanism Program has no Weekly Reports available for Bunyaruguru. The Global Volcanism Program has no Bulletin Reports available for Bunyaruguru. The late-Pleistocene to Holocene Bunyaruguru (also known as Kichwambe) volcanic field straddles the equator along the E side of the Western Rift Valley, south of Lake George. It contains more than 130 maars, 27 of which hold lakes with water ranging from fresh to saline. Friable calcareous volcanic tuffs are inter-bedded with Pleistocene and Recent sediments. Only a few foiditic lava flows have been found. Although no dated eruptions are known, Reece (1955) noted that volcanic activity probably continued into historical times. Reece A W, 1955. The Bunyaruguru volcanic field. Rec Geol Surv Dept Uganda (1953), p 29-47. Tinkler K J, 1971. Statistical analysis of tectonic patterns in areal volcanism: the Bunyaruguru volcanic field in West Uganda. Mathematical Geol, 3: 335-355. The Global Volcanism Program is not aware of any Holocene eruptions from Bunyaruguru. If this volcano has had large eruptions (VEI >= 4) prior to 10,000 years ago, information might be found on the Bunyaruguru page in the LaMEVE (Large Magnitude Explosive Volcanic Eruptions) database, a part of the Volcano Global Risk Identification and Analysis Project (VOGRIPA). There is no Deformation History data available for Bunyaruguru. There is no Emissions History data available for Bunyaruguru. Maars of the Bunyaruguru volcanic field, also known as the Kichwambe volcanic field, blanket the center of this NASA Landsat image (with north to the top) of the eastern side of the Western Rift Valley. The Bunyaruguru field, lying south of the river channel connecting Lake Edward (left-center) and Lake George (top right), contains more than 130 explosion craters, 27 of which contain lakes with water ranging from fresh to saline. 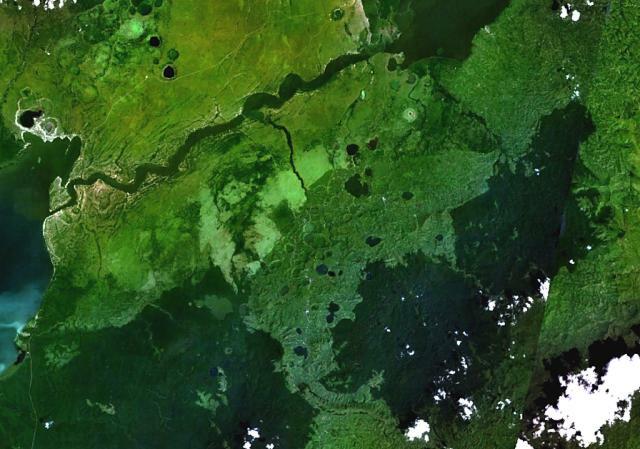 Maars of the Katwe-Kikorongo volcanic field lie across the river channel at the upper left. Large Eruptions of Bunyaruguru Information about large Quaternary eruptions (VEI >= 4) is cataloged in the Large Magnitude Explosive Volcanic Eruptions (LaMEVE) database of the Volcano Global Risk Identification and Analysis Project (VOGRIPA).